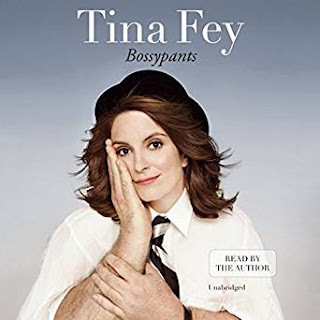 As I had already listened to the audio book edition of Amy Poehler's Yes Please, I suppose it was only a matter of time before I'd get around to listening to Tina Fey's Bossypants to sort of complete the set, in a manner of speaking. Both are talented women who shined during their years on Saturday Night Live together. Since then both have moved on to their own successful careers in entertainment and periodically return to SNL to reprise some of their more popular roles. I wasn't quite sure what to expect out of this book as the title was a little weird (and often printed smaller than the name of the author). Was this supposed to be a book of management tips maybe? Was this a big reveal that Tina Fey actually has gorilla arms? Spoiler alert: those aren't her arms. Synopsis: Bossypants is Tina Fey's autobiographical comedy book that is partly about her life, mostly written in jest. This review is for the Audible audio book edition that was once nominated for a Grammy Award. So what is this book about? This book is mostly about Tina Fey's life and the various things she has learned in life but told in her pretty much signature sarcastic, comedic style. She sort of uses the whole "Bossypants" concept to frame things as her understanding of what it takes to be a successful woman in a world clearly slanted in favor of men. But this is not an overly preachy book nor does it present her speaking atop a soap box. It's all very matter of fact and casual. Naturally a lot of this book covers her career and how she got into comedy. This is a pretty fascinating journey, one that doesn't immediately jump into Saturday Night Live and first journeys through other circumstances before we get to the really fun stuff. And then there's the joys of her talking about the path that led to 30 Rock and her (in)famous portrayal of Sarah Palin on Saturday Night Live. What I Liked: Tina Fey has a clever writing style that makes you feel like you're just chatting at a bar over a few drinks. She maintains this tone regardless of what she's talking about whether it's just silly stuff from her childhood or her appreciating the full ramifications of what they accomplished during the 2008 US presidential election. And I appreciated it more as an audio book as her reading of things is very dynamic including bits that sound like stage whispers or asides muttered loudly under her breath. She's clearly a very smart woman and this shows in her writing and her brand of comedy. She doesn't shy away from subjects and I'm glad that she invests a lot of time into talking about her career and her particular journey. She's led a colorful life but has risen above it all to get to an interesting place and really made a name for herself. And that's awesome. What Could Have Been Better: As is often the case with these biographical pieces, it's a little all over the place. While things generally progress in a chronological order, she does dress things up a lot in various asides and jokes and pokes at this and that and maybe that can get distracting for some. It's entertaining when it's great but it's so much meandering otherwise. At times you sort of wish she took a firmer stand on things or really stepped forward to establish certain points, but of course that could have broken the comedic tone in things. But given how she touches on possibly giving advise to young girls or to other women wanted to get into comedy, maybe she could have risked more? This is not to say doesn't say enough, but one can't help but think of options for making use of that even more. TL;DR: Bossypants is a great book and an even better audio book as Tina Fey's reading of her own words adds something else entirely. If you're a fan of her work in televisions and movies, then you'll get even more of a kick out of what is already a delightful book. The audio book gets a solid 5 witty anecdotes out of a possible 5.